In many occasions in the Metal world, we hear bands that impresses us due their resilience to the passing of time, even not becoming giants as METALLICA, IRON MAIDEN and others from this set. Bands that keep releasing good works in a time when the greater part of Metal fans prefers to stay focused on a narrow group of bands. These courageous bands deserve respect, and we can say that Swiss quintet CRYSTAL BALL is really a survivor, because after 20 years they’re still here, releasing albums. “Crystallizer” is their latest effort. This is their tenth album, so you can expect a band with a defined and solid personality. Yes, they are, playing a classic format of German Power Metal, with some influences from HELLOWEEN on the past, but with some touches from IRON MAIDEN and ACCEPT as well. Their musical is melodic, with the right amount of aggressiveness, very good musical arrangements, fine choruses… Well, we can say that their music is really good, although it’s nothing really new (but they have personality, you can bet on it). Maybe the German influence could be a consequence of the production, because the V-Axe killer Stefan Kaufmann (the former drummer of ACCEPT and guitarist of U.D.O.) worked on the production, mix and mastering of the album. Stefan built something really good, because the sound is clean and heavy, what fits perfectly on the band’s musical work. 13 very good songs are presented on “Crystallizer”, and we could point to the good melodies and chorus of “Crystallizer”, the heavy grasping weight of “Curtain Call” (another excellent chorus, with fine backing vocals, and there’s a very good dose of Hard Rock elements on the song), the aggressive and sharp harmonies of “S.O.S.” (the vocals are showing a very good set of tunes here), the catchy guitar riffs of the elegant “Crazy in the Night”, the excellent keyboards takes of “Gentleman's Agreement”, and the 80’s Hard Rock/Power Metal feeling that fills “Beauty in the Beast” and “Dusty Deadly”. “Crystallizer” is truly a very good album. 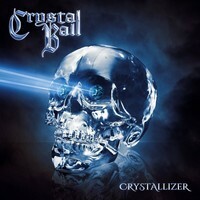 Hear it and get hooked, for knowing CRYSTAL BALL’s work won’t hurt your feelings for the bands you love.